Being able to dock Schooner Adventure at Maritime Gloucester’s Harriet Webster Pier helps us as we re-launch Adventure into the next leg of her storied journey. 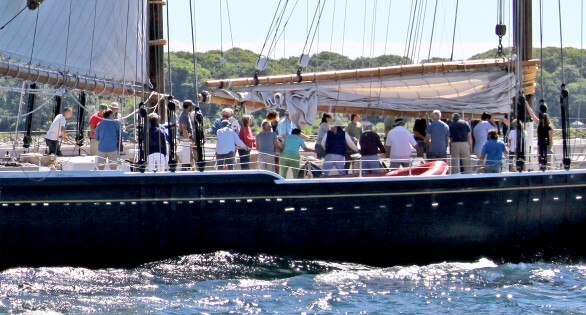 As an integral part of Maritime Gloucester’s historic waterfront campus, including their highly regarded educational programming, Adventure will support Maritime Gloucester’s mission to inspire their visitors and students through hands-on education and experiences that can now occur on board a National Historic Landmark vessel! The Harriet Webster Pier is centrally located on Gloucester’s historic waterfront and provides us with a highly visible berth. It also enables us to sail from an accessible pier, facilitating our mission to sail at sea as a symbol of America’s maritime heritage. Docking Adventure at Maritime Gloucester also provides us access to America’s oldest operating marine railway, enabling us to haul out periodically for maintenance of the vessel—part of our overall mission to preserve Adventure in perpetuity. We will be on display throughout the year—both in the water and out.